Dozens of Israeli soldiers invaded, on Monday at dawn, several areas in the southern West Bank governorate of Hebron, searched many homes and abducted nine Palestinians, including three children. 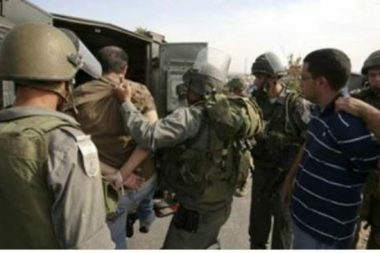 The soldiers invaded many homes in Hebron city, and conducted violent searches, before abducting three children, identified as Samer Hassanein Nahnoush, Othman Ibrahim Morad and Abdul-Rahim Abdul-Aziz Rajabi, in addition to two adults, identified as Abdul-Rahman Awad Sharabati and Mohammad Ishaq Makhamra. The soldiers also invaded Yatta town, south of Hebron, and abducted Nizar Mousa Mohammad, 21, and Mahmoud Jibril Makhamra, 51. Another Palestinian, identified as Khalil Zahran Abu Qbeita, also from Yatta, was abducted at a military roadblock in the town. Mohammad Awad, media spokesperson of the Popular Committee in Beit Ummar town, north of Hebron, said many soldiers invaded and ransacked homes, and abducted his son, Amir, 19. He added that the soldiers also searched old abandoned homes in the town, and attempted to invade Nabi Matta mosque, but the worshippers stopped them. Furthermore, the soldiers invaded al-Qafeer and Roq’a area, in Yatta town, south of Hebron and searched many homes, owned by members of Makhamra family. On Sunday evening, the Ofer Israeli military court, near the central West Bank city of Ramallah, sentenced Nasr Badawi, 35, and his brother Akram, 25, to a life term each, and 60.000 Shekels fine, after convicting them of carrying out shooting attacks, in the period between November 2015 and January 2016, wounding four Israeli soldiers in Hebron governorate.